Stayful Reviews - Is it a Scam or Legit? Stayful is a travel booking site and smartphone app that tempts those looking for accommodations with unique, independent boutique hotels at discounted rates. Stayful helps travelers discover and book independent and boutique hotels at a discount. The New York City startup works to give those searching a boutique experience consistent standards and the best possible price. But the premise behind Stayful isn’t just finding a nice hotel at a good price. Instead, Stayful was founded on the belief that independent boutique hotels can offer unique experiences that can define your trip – and that plenty of travelers miss out on learning about exceptional hotels that cater to unique tastes just because they don’t know where to look. Cheryl Rosner, previously President of Hotels.com and Expedia Corporate Travel, had over a decade of experience in large travel booking websites and recognized a gap where travelers were unable to connect with independent, boutique hotels. On the business side, Cheryl knew that these independent and boutique hotels typically had fewer guests (or more empty rooms) on any given night, and paid more for marketing when compared to chain hotels. Since every empty room is money lost, this meant that independent hotels would be far more likely to offer up discounted bookings for travelers looking for deals within one month of booking. And, that’s how Stayful started: Cheryl got the idea to create a marketplace for independent boutique hotels that allowed travelers to shop lesser-known accommodations at a discount. Where Can I Travel With Stayful? Anaheim, CA, Asheville, NC, Atlanta, GA, Austin, TX, Boston, MA, Charleston, SC, Chicago, IL, Dallas, TX, Denver, CO, Fort Lauderdale, FL, Houston, TX, Key West, FL, Las Vegas, NV, London, UK, Los Angeles, CA, Miami, FL, Milwaukee, WI, Montreal, QC, Nashville, TN, New Orleans, LA, New York City, NY, Orlando, FL, Palm Springs, CA, Philadelphia, PA, Phoenix, AZ, Portland, OR, San Antonio, TX, San Diego, CA, San Francisco, CA, Santa Fe, NM, Savannah, GA, Seattle, WA, St. Louis, MO, St. Thomas, USVI, Telluride, CO, Toronto, ON, Vancouver, BC., and Washington D.C. However, they’re constantly adding agreements with new hotels, and it’s worth checking back if where you want to go isn’t offered yet. On the consumer end, Stayful works much like Expedia or another big booking site that you’re probably already familiar with: Once you’re on the homepage, just put in where you want to go, for which dates, and how many rooms are required. 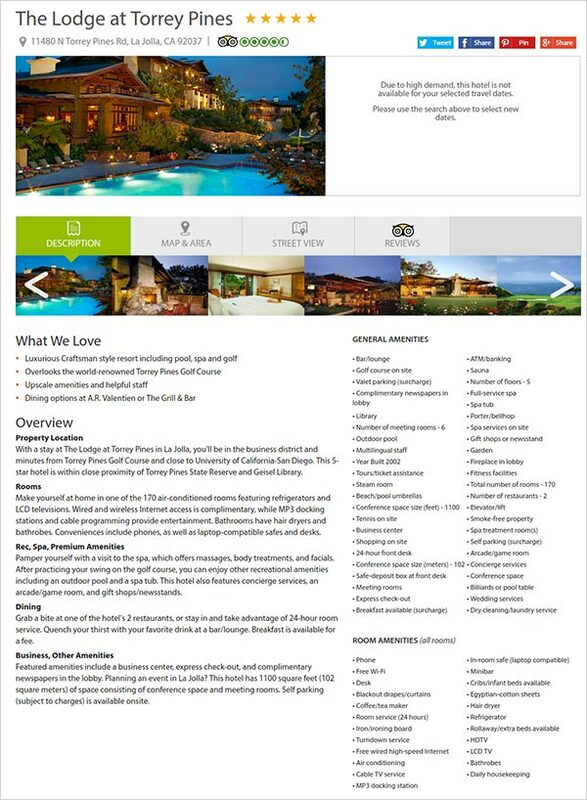 Stayful then presents travelers with a list of available hotels in the area. However, there are a few unique differences between your standard booking website and Stayful. First is the “booking window,” i.e. when you should be using Stayful in relation to the dates of your stay. Stayful is best used within 30 days of your travel date. That’s because, prior to 30 days out, hotels are still expecting additional bookings and aren’t interested in giving a discounted rate. However, once it’s within 30 days, the hotel is fairly certain that those rooms aren’t going to be snatched up, and are willing to give a deeper discount. That shorter booking window leads to the next point: Stayful users will see two different prices when browsing available accommodations, as seen in the image above. How does this work? Stayful runs an algorithm to determine what is good, better, and best pricing at the time of your search. This eliminates the need for shoppers to have to make their own offer, like on Priceline. However, it also takes popular travel weekends and expected occupancy into consideration. In a nutshell, this means that the prices that you see advertised on Stayful aren’t fixed – they can change day to day. So, if you see a price that’s particularly appealing, your best bet is to jump before it changes. What Kind of Traveler Does Stayful Appeal To? Stayful aims to please millennial-age travelers who are interested in unique experiences and well-designed spaces. We spoke with Cheryl Rosner about some of her favorite hotel’s amenities offered by accommodations listed on Stayful, which included 24-hour fitness centers (some with personal trainers), minibars stocked with fresh fruit, free bicycles for guests, and other touches that independent hotels include to improve your stay. However, Cheryl’s favorite hotel is the Arlo in New York. “What I love about Arlo is that it’s the most efficient hotel room that I’ve ever stayed in,” she says. Another favorite is La Jolla’s The Lodge at Torrey Pines, near San Diego. “Aside from the fact that it’s stunningly beautiful, the amenities are are just amazing,” says Cheryl, who described the hotel's in-suite fireplaces and restful ambiance as the perfect location for a staycation. 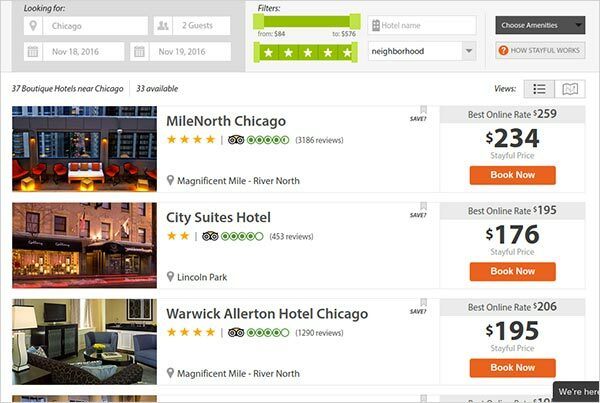 To help travelers choose, each hotel listing on Stayful includes the hotel’s star rating, along with how they’re rated on Travelocity. However, as you can see from the image above, Stayful’s descriptions of each hotel take great care to list out all sorts of details about the location, rooms, amenities, dining options, and aspects that they love to ensure you’re able to identify a perfect fit. The Stayful smartphone app (available only on iOS) has a feature that you won’t find online: the concierge. Stayful’s concierge is a real person, not an algorithm, who’s there to learn about what you like, then suggest the perfect independent boutique hotel to suit your travel needs. Of course, if you don’t use the app, or have an Android, you can also write Stayful’s customer service for the same personalized recommendations. However, there are a few extra perks that Stayful’s concierge offers. For example, if you want to see a show on Broadway or try a specific restaurant, your Stayful concierge can set it up. Want something delivered to your room and don’t want to call downstairs? Ask your concierge! Basically, this extra feature, which is on par with a personal travel assistant, does everything possible to ensure that your stay is perfect. How Much Does Stayful Cost? While you do need to sign up for a Stayful account to book a room, doing so is totally free. That means, aside from the price of a hotel, there’s no extra cost tacked on to the price of your room and no fees. One thing to note is that, while searching for hotels on Stayful, the list of results will tell you if any given price is a “Stayful price,” meaning that there’s a discount that’s been negotiated by the service, or if it’s simply the lowest available price online. I chose not to compare any that were just “best available,” because they were accurate – it was the same price you could find on the hotel’s official website or Travelocity. However, true to their word, Stayful does offer discounts of at least $10 (and sometimes up to $50 or more) on nightly accommodations. Bottom Line On Booking Accommodations Through Stayful? The hotels listed on Stayful aren’t bottom-dollar accommodations, although, there were definitely less-expensive options than the establishments that we showcased above. That being said, the kind of hotels that Stayful picks are typically for the young and hip – or, at least, hip. According to Cheryl, these aren’t particularly family-friendly hotels, and Stayful is more likely to pick an establishment that offers a masterful bar or lounge than kid-oriented activities. Additionally, while the prices aren’t astronomical, these aren’t the sort of hotels that you book when just in need of a place to crash when passing through. The hotels on Stayful’s roster offer carefully curated experiences, a range of ambiances, and an overall sense of refinement. You won’t find one and two-star hotels here, nor any giant Vegas casino-sized hotel that has over 100 rooms. Instead, they’re intimate, fabulously decorated, and each with a very distinct personality that can enhance your stay. So, if you’re tired of wading through hundreds of hotels on Travelocity and are interested in finding accommodations that are just a little different, definitely try searching Stayful before your next vacation. One final note: Because Stayful negotiates lower prices with hotels who then lose out on other bookings by reserving your room, there are no refunds. So, before you book, make sure your plans are set. Write a Review for Stayful!